Rise of Mana and Deadman's Cross coming to PS Vita. 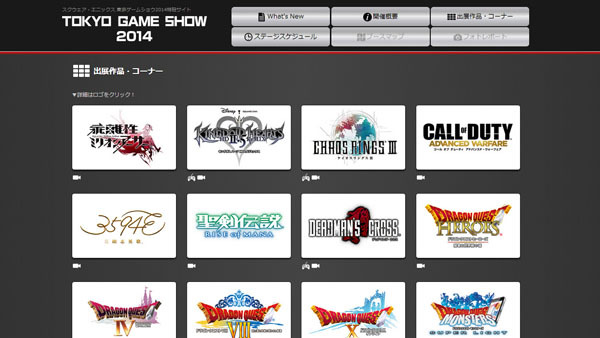 Square Enix has opened its Tokyo Game Show 2014 website. The publisher’s lineup reveals newly announced PS Vita versions of smartphone games Deadman’s Cross and Rise of Mana. Both games are due out on the handheld in Japan this winter. The PS Vita version of Deadman’s Cross will support both touch and controller play. Rise of Mana will have added original events. Square Enix will also host a number of stage events, including those for Dragon Quest: Heroes and Bravely Second, which will be live streamed on Niconico. Bravely Second Special Stage – Featuring Tomoya Asano (Producer), Shinji Takahashi (Assistant Producer), Goemon (Dengeki Online), and Mai Aizawa (Edea Lee Voice Actress). Featuring development talk and new gameplay. Junichi Suwabe and Masakazu Nishida Wake-Up Tune! TGS 2014 Tour Special – Featuring Gunslinger Stratos 2 voice actors Junichi Suwabe, Masakazu Nishida, Atsushi Abe, and Kana Ueda. Introducing a big collaboration with a popular console game. Dragon Quest X TV TGS 2014 Tour Special Edition – Featuring Ayana Tsubaki (Star), Yosuke Saito (Producer), Makara Saito (Director), and Takashi Anzai (Planner). A special delivery of the monthly Niconico broadcast “Dragon Quest X TV” at the Tokyo Game Show. Look forward to a “Battle Trial” at the assembly hall, as the development team and MC Ayana Tsubaki challenge the game’s current strongest monster. Final Fantasy XIV Producer Live Letter in Makuhari (Day 1) – Featuring Naoki Yoshida (Producer and Director). One year after the launch of A Realm Reborn, Yoshida looks at various data. SiSiLaLa-San TGS 2014 Tour Edition – Featuring Takehiro Ando (Producer), Hiroaki Iwano (Producer), and Satomi Akesaka (Voice Actress). And for Kaku-San-Sei Million Arthur, featuring Alisa Fujisaki, Asayumi Mizukoshi, Miki Yokota, and Rena Sato. The latest news on Square Enix smartphone apps, as well as guest appearances from Jitsuzai-Sei Million Arthur actors and the latest news on Kaku-San-Sei Million Arthur. Square Enix Music Composer Talk Show – Featuring Kenji Ito, Yoko Shimomura, and Yasunori Mitsuda, with Weekly Famitsu editor Masa Miyokawa MCing. Final Fantasy VII G-Bike and New Smartphone Title Creator Talk Event – Featuring Hiroshi Matsuyama (CyberConnect2 CEO), Ichiro Hazama (Producer), and Suzuki Kyohei (Director). Latest news on the fall-due Final Fantasy VII G-Bike and a new smartphone title that will soon be released. Dragon Quest: Heroes Demonstration Stage – Featuring Ryota Aomi (Producer). A developer talk show and gameplay demonstration of the spring 2015-due Dragon Quest: Heroes. Final Fantasy XIV Producer Live Letter in Makuhari (Day 2) – Featuring Naoki Yoshida (Producer and Director). Yoshida answers a variey of user-asked questions from around the world. The Tokyo Game Show runs from September 18 to 21.